I’ve told this story a thousand times. I stood in a chain discount store, staring at the action figures, trying to recall what four-year-old Patrick had asked Santa to bring. I finally settled on something and hoisted it into the cart. A wistful teenage clerk spoke to me. I love my son, make no mistake. But I imagined he would be a girl. I was so certain that I had her name selected — Elizabeth Lucille, after my sister Joyce Elizabeth and my mother Lucille Johanna. When I had amnio, the technician asked if I wanted to know the gender. I shook my head and said, “No, I don’t,” in a loud clear voice. I didn’t need to be told; I knew. “It’s a boy,” she crowed. Which part of “no” didn’t you understand? I have not forgotten her stunned look, nor my next question: How in God’s name will I potty-train a boy? She shook her head and muttered, “Pregnant women. Spare me.” I don’t think she meant me to hear. I couldn’t think of a boy name until Patrick was a week old. I called him “Buddy” for those first days, a name which he subsequently carried until late in elementary school. But I love my son; and he loves me. He’s kind, strong, and gentle. He’s witty, talented, and accomplished. He inherited his writing talent from his mother’s side and, it must be said, his musical talent from his absent father. Thankfully, he got his father’s calm demeanor but just as thankfully, his mother’s fiercely loyal nature. I’m glad, now, that I had a boy. But I truly did want a girl. I’ve latched on to other people’s daughters over the years, hopefully not in a creepy way. In the first of my ill-fated marriages, I strained to be a decent stepmother to Kim and Tshandra. I failed, but later in life, I’ve reconnected with them, especially with Tshandra. Our relate gives me extraordinary enjoyment. My son’s best friend Chris has two sisters, and I came into my surrogate mother role with them. I relish the times that I’ve had with Caitlin and Jennie. I take a small measure of satisfaction that I might have done them some good. They both turned out smashingly. I had another stepdaughter, Cara; and I mourn the loss of my relationship with her because she’s a fabulous woman, beautiful, keen-spirited, tenacious, determined. Then there’s a few more, the daughters of friends — Abigail Vogt comes to mind, with her two little boys growing like weeds. Abbey will be married this fall, and I am hoping to play some small role in her ceremony. This morning, I left the Delta with the sun full in the sky here in the river valley. I headed north. A blanket of fog clung to the foothills above the San Pablo Bay. I drove for two hours, to Windsor, to the home of another of the girls whom I’ve collected and from whom, with the blessings of their mothers, I vicariously derive the experience of being a girl-mother. I met Sharon Alberts and her daughter Ellen Cox at Pigeon Point Hostel several years ago. They had come down to see the seals. We got to talking about yoga, and I sensed something phenomenal in each of them. 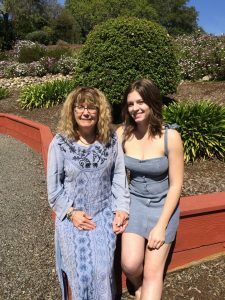 Sharon has a peaceful, kind spirit, and her sweetness shines from her daughter’s eyes. Ellen’s fierce intelligence dominates her persona, though. Every moment that I’m around her, I sense that she hovers one step away from greatness. Maybe I got what I wanted after all: the wonderful son who will never forsake his mother, no matter how far he roams; and the chance to share in the lives of some grand girls who’ve grown to be phenomenal woman. Yes, yes; and oh, it was Batman that Patrick wanted. Turned out, I had gotten it right. It’s the first day of the fifty-second month of My Year Without Complaining. Life continues. Me and the lovely Ellen Cox.